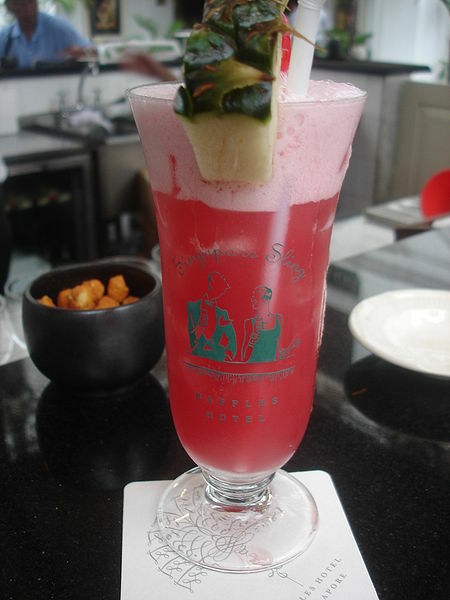 The Singapore Sling is a cocktail that was invented by Ngiam Tong Boon, a bartender working at the Long Bar in Raffles Hotel, Singapore before 1915. Recipes published in articles about Raffles Hotel prior to the 1970s are significantly different from current recipes, and "Singapore Slings" drunk in Singapore at large deviate from the recipe used at Raffles Hotel. The original recipe used Gin, Cherry Heering, Bénédictine, and most importantly, fresh pineapple juice, primarily from Sarawak pineapples which enhance the flavour and create a foamy top. Most recipes substitute fresh juice with bottled pineapple juice; club soda has to be added for foam. The current Raffles Hotel recipe is a heavily modified version of the original, most likely changed sometime in the 1970s by Ngiam Tong Boon's nephew. Today, many of the "Singapore Slings" served at Raffles Hotel have been pre-mixed and are dispensed using an automatic dispenser that combines both alcohol and pineapple juice to pre-set volumes. They are then blended instead of shaken to create a nice foamy top as well as to save time due to large number of orders. However, it is still possible to request for a shaken version from bartenders. Pour all ingredients into cocktail shaker filled with ice cubes. Shake well. Strain into Poco Grande glass. Garnish with pineapple and maraschino cherry.